The Danish brewery, Carlsberg, has served up the perfect chaser to Coke Zero’s drinkable billboard with its new beer-dispensing billboard. In an effort to reach a large round of beer lovers, Carlsberg placed the billboard at The Old Truman Brewery on Brick Lane in London. The brand stayed on tap to ensure that all drinkers were over 18 and to prevent any problems from brewing. Adweek.com shared the campaign to show how product-dispensing ads are becoming indispensable in outdoor advertising. 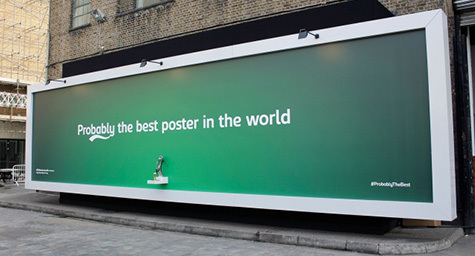 Carlsberg had been searching for a way to increase brand awareness and consumer engagement throughout the UK. They wanted a concept that would create lots of buzz. This led the beer brand to draft Fold7 and Mission Media to develop the refreshing outdoor campaign. They came up with an advertising concept that created a buzz in many ways. First, they erected the beer-dispensing billboard at a site where guzzlers gathered. 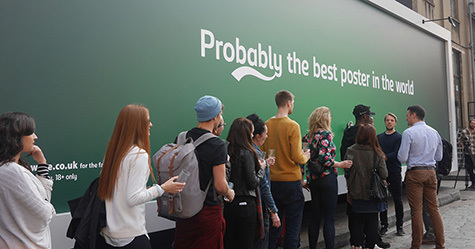 Then, they emblazoned the billboard with the crafty headline, “Probably the best poster in the world.” Finally, beer lovers lined up to get a free taste of Carlsberg beer. Discover strategies for successful outdoor advertising. Contact MDG Advertising. MDG Advertising is a full-service advertising agency and one of Florida’s top branding firms. With offices in Boca Raton and New York City, MDG’s core capabilities include branding, logo design, print advertising, digital marketing, mobile advertising, email marketing, media planning and buying, radio and TV advertising, outdoor advertising, newspaper advertising, video marketing, retail marketing, website design and development, content marketing, social media marketing, and SEO. To discover the latest trends in advertising and branding, contact MDG Advertising.